The Enugu state command of the Nigeria Police Force has arrested a herder armed with an AK47 rifle at Ugbawka in Nkanu East Local government area of the state. The arrest followed a distress call by members of the community to the command. A statement by the spokesman of the command, Ebere Amaraizu, said the police on receiving the distress call quickly dispatched its officers to the location where they intercepted the herder bearing an AK47 rifle with ammunition. 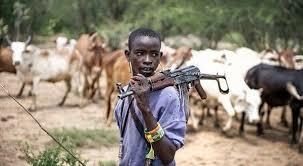 “The suspected herder is now helping the police operatives in their full scale investigations,” Mrs. Amaraizu said. Following the arrest and recovery, the Commissioner of Police, Enugu state command, Danmallam Mohammed, visited the farmland and the community. He was accompanied by a notable indigenes of the area, Fidelis Edeh, and a Councillor in the Council, Peter Edeh. The Commissioner commended the effort of the community with their timely and useful information which led to the arrest of the herder. He maintained that his command must continue to partner with communities to ensure public safety. Responding, the Chairman of Nkanu East Local Government Area, Ikechukwu Ubagu, expressed happiness with the response of the police, the arrest of the armed man. He said there was no tension in the area as farmers were still on duty. He also assured of their continual partnership with the police. The police chief, Mr Mohammed, used the occasion to further release all the state commands distress/emmergency numbers.